You can download these songs, burn them onto a cdr and listen to them anywhere! all songs on this website are traditional songs, and the arrangements are by me (Matt R.) copyright 2008-2018. 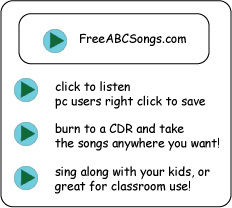 You are free to download all of the songs and copy them to a CD. any questions, feel free to email me. thanks. User Agreement: The songs on this site are for personal and educational use only, and they may not be posted on another website or used in YouTube videos. Any use of these songs for a commercial project without prior written consent is a violation of Copyright, and will be subject to applicable fines. If you would like to use any of these songs for a commercial project please contact me. Nursery Rhymes Mp3's and Printable Lyrics: These are your favorite Nursery Rhymes read over comforting background music. Great for sleepy time, or to calm down the kids. More to come soon! Click here for the following Nursery Rhymes: Humpty Dumpty, Jack and Jill, Pat-A-Cake, Hush Little Baby. Acapella- The following Nursery Rhymes are sung without a musical background, like you would sing to your child before bedtime. I have over 300 Children's Song videos on my DreamEnglish Kids YouTube Page. Kids Songs in English iPhone and iPad Apps! 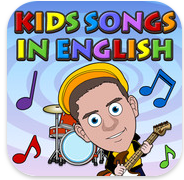 Check out the Kids Songs in English Apps. This App contains 5 favorite Kids Songs videos with the mini Matt Character. Special introductory price of USD $0.99. Click here for more about the iPhone App. Click here for more about the iPad App. New! Kids Songs in English 2 HD iPad App! This new iPad app contains 3 brand new song videos for Bingo, The Wheels on the Bus, and Old MacDonald. Plus a fun interactive activity page for each song! To learn more, click here! Find Dream English Kids on YouTube, Spotify and Itunes! Sheet Music: The downloadable sheet music is in a pdf format, and includes chords and lyrics. click on a song title to go to the page with the sheet music. Need some free printable coloring sheets? Check out MES Coloring.